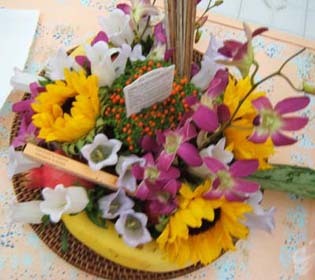 7a.m. 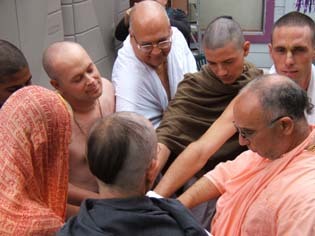 - a group of devotees standing in line to shave their heads. 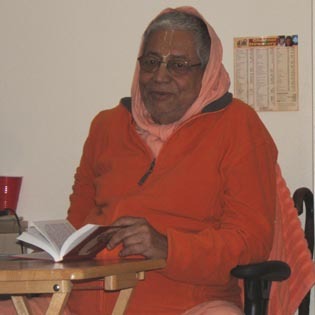 Today Srila Govinda Maharaj will give second initiations! 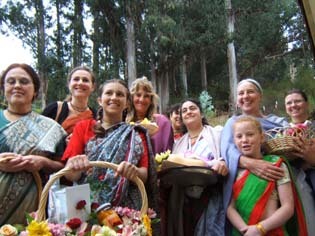 Many ladies waiting to take second initiation. 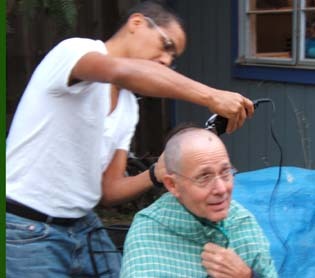 They go first while the men prepare. 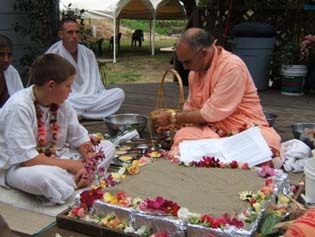 The initiates give their offerings to Srila Gurudev. 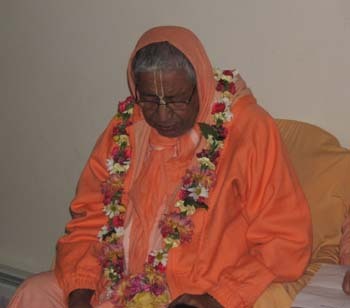 Srila Govinda Maharaj sitting on his veranda. 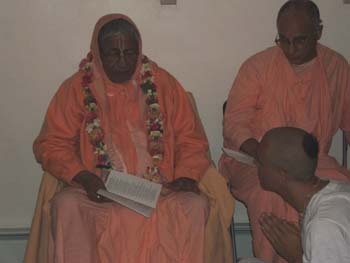 One hour later, Janardan Maharaj performing the fire yagya. 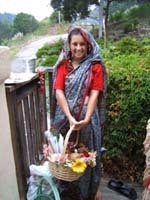 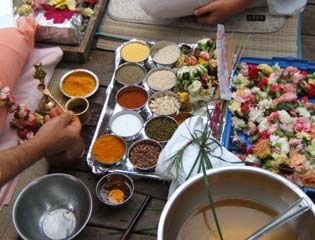 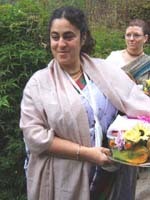 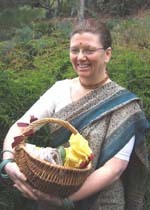 The paraphanalia includes: grains, rice, spices, ghee, flowers, fruit, and incense. 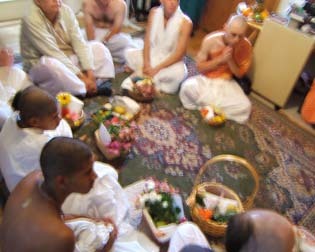 The happy initiates, listening to the mantras during the ceremony. 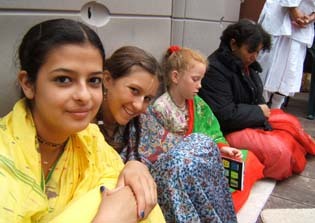 Huddling to recieve their brahman thread. 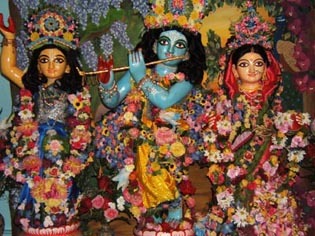 Devotees gather on this auspicious day. 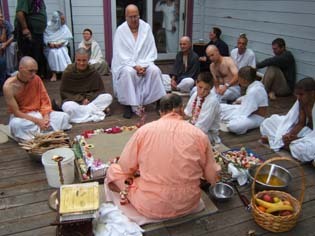 Previously, Srila Govinda Maharaj giving first initiation to several newcomers from Oregon, California, and Colombia. 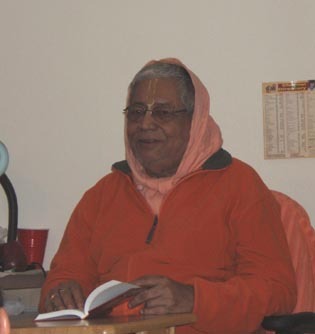 Formerly Fable; now Krpa Sindhu Prabhu. 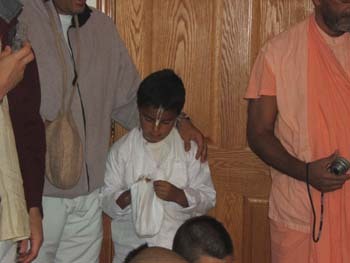 Nimai Prabhu from Colombia chants his first Japa. 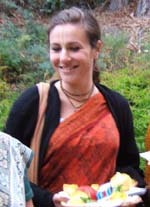 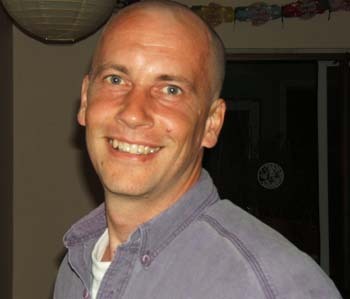 Tamal Bharan Krsna Prabhu, newly initiated and engaged in seva 24 hours a day.